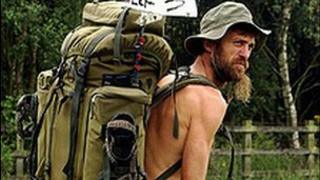 Naked Rambler Stephen Gough has been arrested in Fife just days after being released from prison. Mr Gough, 53, had spent more than six years in jail after being repeatedly re-arrested outside the prison gates when he refused to wear clothes. He was allowed to go free from Perth Prison on Tuesday and not re-arrested, in an apparent change of policy by Tayside Police. However, Mr Gough was arrested over a breach of the peace near Dunfermline. The arrest, by Fife Constabulary, took place in Townhill at about 14:00. Mr Gough is in police custody and is expected to appear at Dunfermline Sheriff Court on Monday. The former marine, from Eastleigh in Hampshire, first earned the nickname The Naked Rambler by walking unclothed from Land's End to John O'Groats in 2003, after quitting his job as a lorry driver. He undertook a second naked ramble in 2005 which he did not complete until February 2006 because he was frequently arrested on the route. Mr Gough returned to Scotland later that year to answer breach of the peace charges he had picked up during his naked walk. He was jailed for four months but his refusal to wear clothes in court, in prison or in the street saw him returned to prison immediately after each release over a six-year period. Speaking outside Perth Prison on Tuesday, Mr Gough said he had no intention of changing his ways.